Vanilla electrified the palates 'and noses' of the Spanish explorers who were introduced to the spice by the Aztecs, and the Spanish carried it back to Europe, where it was cultivated and exported around the world. Today, it is ubiquitous, imparting its sweet, distinctive taste to a range of desserts. Some cooks slice vanilla beans open to scrape out the aromatic insides, but a much more common source of vanilla flavor is vanilla extract. Charles H. Baldwin & Sons, of West Stockbridge, Massachusetts, is a family-run business that has been making vanilla extract since 1888. The company is run by Earl Baldwin Moffatt and his wife, Jackie Moffatt, and they operate under a dictum that was handed down by Earl's great-great-great-grandfather: Never buy inferior beans, and never tamper with the recipe. In the 111 years since the company was founded, they never have. They even use the same oak aging barrels that held Charles H. Baldwin & Sons' first batch of vanilla extract. Two batches of extract are made each month, and each batch uses twenty-two pounds of vanilla beans imported from Madagascar. The first step in the process is to put the beans into a copper percolator with a water-and-alcohol solution; the beans stew for five days at 125 degrees. The solution is drained and then poured over a second tin of beans, which is left for four more days. After carefully filtering the liquid, it is placed in oak barrels to age for two weeks. Jackie and Earl say using the oak barrels is essential in bringing out a more mellow, less metallic taste. 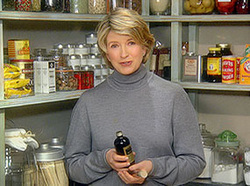 When the two weeks are up, Jackie measures out bottles of the extract to sell to bakers and ice-cream and candy makers, as well as to private customers through mail order and the shop.